I still look at property snake from time to time. Today I looked at Northamptonshire, as I do, and listed all the properties according to current price. 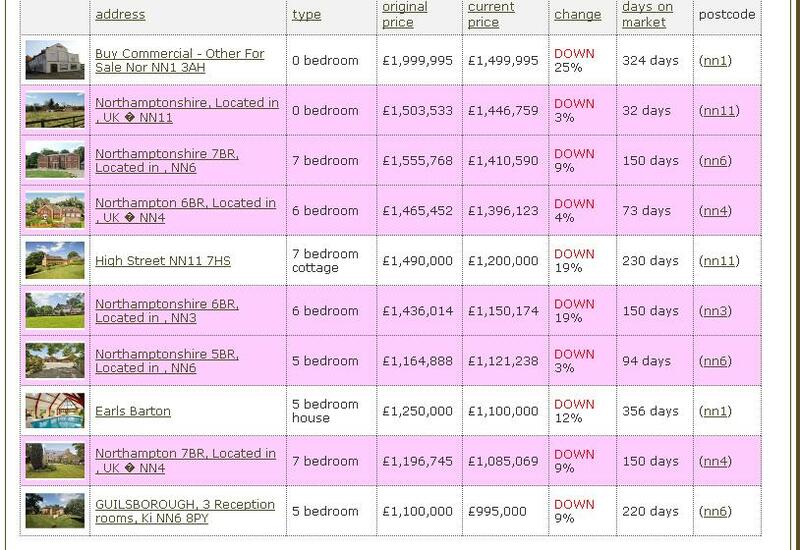 6 of the 10 most expense properties in Northants have dropped their prices this week. Look at this one, over a 1,000 days on the market. The fourth one from the top started at £1,465,452. It seems to be on at £965,000 now. I wondered if there was an exchange rate effect with all of the frequent price changes. It looks as if the WSJRE site is a bit "buggy". The 1000 day club has lots of members now !!! Image what impact properties like the one you listed will have on the Nationwide, Halifax and Land Registry indexes when they eventually find a buyer!!!! I check Maidenhead / SL6 area, Birmingham and London on rightmove on a daily basis with Property Bee add-on on Firefox for properties changes within last 24 hours and I'm seeing the same thing in every area; large number of new instructions, between 10 and 25% of changes being price reductions, up to 10% of properties becoming available despite being SSTC or under offer. Anyone who has the time (and inclination) to check these areas on a daily basis will see the same. I suspect it's being repeated across a whole number of areas. It doesn't mean that the new instructions are being priced sensibly (often they're not) but when a 2-bed flat in a brand new development is being marketed at £300k and then one appears on the Land Registry having sold at £220k, it doesn't take a genius to work out while some offers are being retracted. It's odd tho as it did this leading up to the election and then seemed to return briefly to silly season. Announcement of emergency budget and possible CGT changes seem to have kick-started it again, but depending on what happens on 22nd could be just another false dawn. I fear for it to really kick-off, we're going to have to wait for the redundancies to really kick in and another banking scandal. Main thing I'm noticing is that Property Snake is still going... nice to have that resource still there to augment property bee. The main thing we are going to have to wait for is the prices to drop to a level where people are able to afford to buy a house....then the figures will hit the indexes. Repo's cant be far off making a return to the market, the government funding of people to stay in their houses is one of those luxuries we cant afford to keep going....so the banks should be allowed to reposses again. Well done though to Gordon brown for giving people an extra 18 months in their homes, long enough to save a rental deposit...I hope. Well done though to Gordon brown for giving people an extra 18 months in their homes, long enough to save a rental deposit...I hope. I'm still laughing at this one CountofNowhere! What's more it's actually true!!!!!!!! My snake is definitely slithering down for sussex. Many more drops on there than last October. According to my Property Bee, that 2nd one started at £849,950 (dropped to £785k on 15/11/08) - making that a fall of 29%! what the hell?!? In my area ( Exeter) prices are going up now. EA going crazy or desperate? I've seen a couple of them too. I explain them by thinking the vendors are getting low offers, say 20% below asking, so they put their prices up so they get 20% below asking at a higher asking price....this might come to be known in the future as "gordon's logic". Bet he wishes he'd put that on the market for £117,500 in 2007, he'd probably have got it and saved himself a lot of grey hairs. After years of ramping it's going to take people a while to deprogram themselves and get to grips with the mechanics of a bear market. Lesson 1: The seller who cuts fastest sells first while the market price is nearer the top. The stubborn ones who insist on "holding out for what it's worth" are going to lose the most, plus if it was granny's old house they'll have chipped in a few years of council tax and gardening/repairs for nowt.